It is always a little bit awkward, isn’t it? The day your employee leaves. And that final moment. Everyone gathered around, shaking hands, maybe hugging with good luck wishes and promises to meet up soon for a beer. But freeze frame this moment right here. What would you like to find out from Abigail before she walks out of the door? Inside the head of your departing employee is employee retention gold. Think about what they could tell you about how you could improve, both as a leader and as an organisation. What’s that you say? You have already done an exit interview? Tell me honestly, how are they working out for you? Let’s pretend I have a magic wand. I am going to fix three things about those interviews that can get you to the real truth about why your staff are leaving. Your employee is not able to dodge the truth. They will give you 100% honest answers to your questions. How could I be a better manager? What could we do to make this a better place to work? Do you feel like you developed as a person here? Who are the best people that work here? What could we have done differently to have avoided this situation? What was the trigger for you to start looking for a new job? Have a frank discussion with the leadership team. Share the findings with the workforce and tell them what will change. Give training to that manager who is frequently mentioned in these interviews. Do something about that toxic team member who is causing way too many issues. I’ll put my magic wand away now, but ask yourself three questions about the exit interviews you are conducting. Do you think your employees are giving you honest feedback? Does anything change because of that feedback? And finally, are they even worth doing? Without honesty on their side, and action on yours, I am not sure they are. Sarah just feels awkward. Why would she really say what she thinks when she can cite ‘time for a new challenge’ and get out of this embarrassing situation faster. Darren simply doesn’t care enough anymore to give you honest answers. Kevin, who knows what his colleagues have said at exit interview when they left, and he saw no change. So why bother. ‘Just time for a change’ he says. What is the incentive for your employee to tell the truth? The only real incentive I see is the desire to make it a better place for their colleagues they leave behind. Have you ever resigned from a company because you didn’t like the way the company conducted themselves, or the way they treated their people. You really hoped that your leaving would make some kind of difference. So maybe you were honest at the exit interview, but where did that information go? The hard truth is that often nothing changes. A summary of your exit interview may not have got further than your HR file, or your line manager’s inbox. The results are compared with the employee engagement results, a list is made of the 3 most important reasons. We make a short calculation on the cost to the company and show it to whoever is responsible for company results. The feedback is fed into our Quality Management System and is reviewed periodically along with feedback from other areas in the business. Any information about an individual or department that are mentioned in the interview is shared with the individual or manager. The results are summarised and fed back annually. The results are presented in a statistical report which conceals the employee’s identity. Specific concerns are raised with directors. But very often little is done with the information gathered. There was a recognition that exit interviews can help identify training needs, weaknesses in recruitment and induction of new employees as well as management development. But there was a sense of frustration that this was rarely the end result. Maybe the reticence from businesses is based on knowing that many employees don’t tell the truth in exit interviews. So this just becomes a tick box exercise, instead of a way to improve their business. 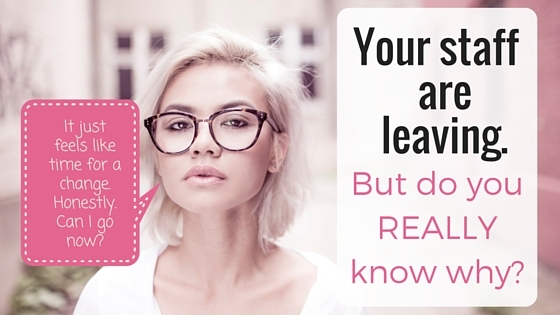 So how do you find out how why your employees are leaving? Let’s go back to our freeze frame picture. We don’t need a magic wand, we need a time machine. We need to go back a few months, before they started looking at job sites and accepting calls from head hunters. That’s when we need to have the conversation. Pick the key roles in your business. The people that you really don’t want to lose, or the roles that are difficult to resource. Once a year sit down and ask what they love and what they hate about their job and the company – while they are still loving it more than hating it! In this way, you are getting valuable feedback which could really make a difference to that individual. So they will feel more inclined to talk. That conversation alone could stop you having to buy a leaving card for a good while longer. Some managers are nervous about rocking the boat, making their employees think more intensely about whether this is where they want to be. But in reality, most employees are pleased to have this conversation. It tells them that what they do for the business is important, but so is what the business does for them. You can find some good examples of questions you might ask here and here. The tip is to keep the conversation structured and include some things that you can fix as a manager rather than waiting for a mighty organisation to respond. In most cases, a resignation shouldn’t be a surprise. If you are talking to your team members and listening to what they are saying, you should spot the signs. You may not stop it happening, but you would have had the opportunity to try. Listening and action results in trust. And employees who trust you are more likely to raise any concerns early. Losing staff is probably one of the most disruptive things that can happen to your business. But sadly, there are no magic wands or time machines. So be proactive; ask questions, listen to the answers and act on them. And make sure you communicate what you have changed based on their feedback. Show them that it is worth voicing their ideas for improvement. And if you are reading this and wishing this was something your company would adopt, take control. Look after your world. What’s stopping you scheduling stay interviews with your people. Look after your team – because you will be the one that will suffer most if they leave.